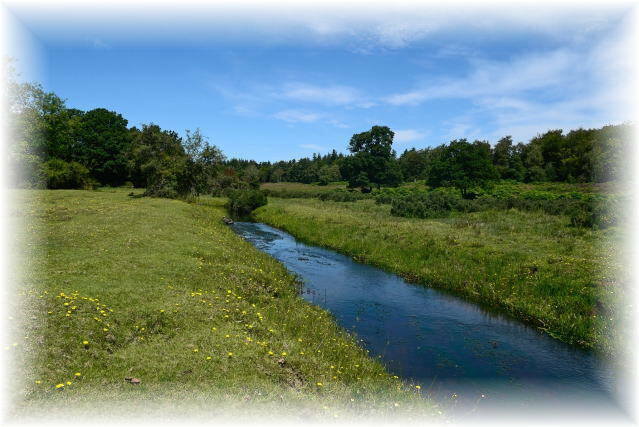 Ober Water is a gravel bedded stream which flows east from near Burley through open heath then woodland, joining Blackwater to form the Lymington River. This is the only place in the New Forest to see White-legged Damselflies. Other species of note are the Golden-ringed Dragonfly, Southern, Small Red and the rare Scarce Blue-tailed Damselfly. The surrounded heath is a prime spot for Keeled Skimmers, where they can be seen in their thousands around the many feeder streams and boggy pools to the south and in teneral form anywhere among the heather. Also to the south are Duckhole Bog, and Holmhill Bog, the latter feeding the Silver Stream, another prime spot for the Southern Damselfly, Beautiful Demoiselle and Golden-ringed.. There are several approaches to Ober Water. At the western end park at Mill Lawn and follow the stream east towards Markway Bridge. Along this stretch you will find, depending on time of season, Golden-ringed, Black-tailed Skimmers, Beautiful Demoiselle and Small Red Damselflies while in the feeder streams and pools to the south there are Keeled Skimmers, Broad-bodied and Four-spotted Chasers. It is also worth looking in the side channels for Scarce Blue-tails. For the Eastern End park at Puttles Bridge and walk west toward Markway Bridge. Puttles Bridge also offers the best approach to the Silver Stream.